Title: NS C40-9W's head to Fort Wayne with autoracks. Description: A Fort Wayne-bound RoadRailer is about to thunder over the CSX Columbus Sub. I was only one of about a dozen photographers at Columbus Avenue this day. 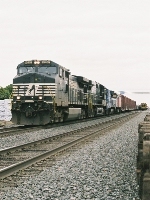 Description: Eight NS locomotives lead a mixed freight at Varnell, Georgia. Within 15 minutes a train of stacked containers and auto racks, lead by Conrail 6738 passed by headed north. Description: Unit trash train from Newark heading west on track one with a primer GEVO trailing. The smell was pretty bad. Description: New NS unit trash train 65J blows west through the truss bridge at Bound Brook with lots of blue containers. Description: Westbound on track two with a trio of GE widecabs. Description: 134 coasts down the hil with the same lashup that would go out on 173 later in the day. Description: This oddball came westbound as 18N we arent sure why an even numbered train was heading westbound. That is 66Z on the controlled siding.